Top row (left to right): 1. unidentified, 2. Gina Wood, 3. Perry ?, 4. Gina ?, 5. Roger Thomas, 6. Lorrie Hallquist, 7. unidentified, 8. Robin Lombard, 9. Kenny Bain ?. Second row: 1. unidentified, 2. unidentified, 3. Lisa Deming, 4. unidentified, 5. Tracy Lassallette, 6. Ronnie (Ron) Cairo, 7. Tami Torres, 8. Ed Sandoval, 9. Dana or Lana Moomau. Third row: 1. Tom Gregory, 2. David Hamby, 3. unidentified, 4. 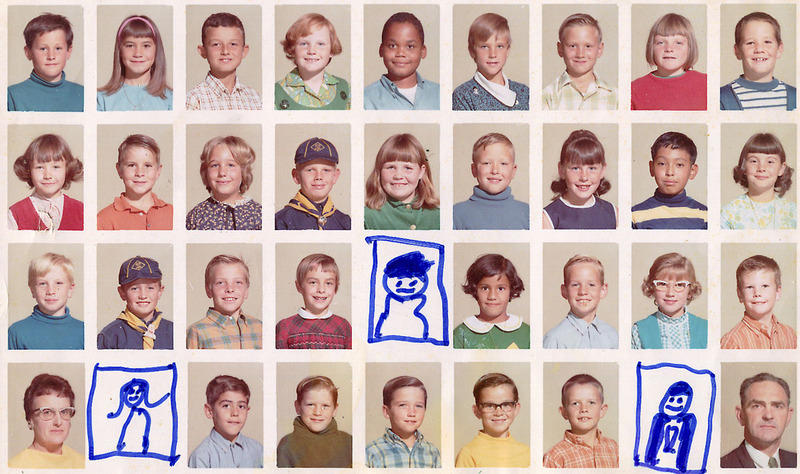 Kim McDaniel, 5. no picture, 6. Susan Valasek, 7. unidentified, 8. Cathy Moreno or Teddy Ketchum, 9. Daniel Maycock. Fourth row: 1. Mrs Nelson, 2. no picture, 3. Mark Gilmore, 4. unidentified, 5. unidentified, 6. unidentified, 7. Jay D. McGowan, 8. no picture, 9. unidentified. Credits: From the collection of the Lombard family. Thanks to Kathy (Lombard) Kammer, Linda (Brown) Trudeau, and Gina (Wood) Labonog for identifying the kids in the picture.